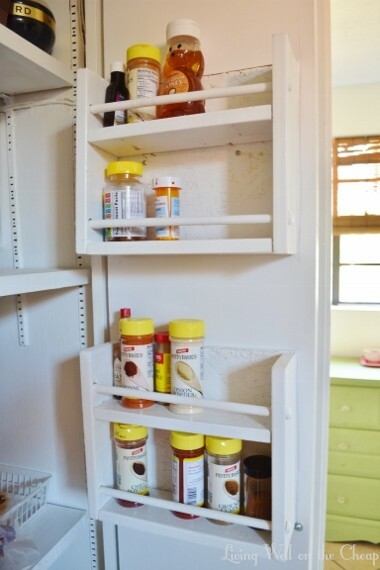 One of the reasons I was really excited to replace the bifold doors on my pantry was so that I could add some storage to the inside of the doors for spices, medications, foil and plastic wrap, etc. I worked on these on and off over a week or two and I don’t feel like my pictures do a great job of explaining the process, but I was heavily influenced by this and this from Shanty-2-Chic so if you want to see how someone who actually knows what she’s doing made something similar you can click over there. So I started with some 1×3 boards that I already had (they used to be slats for a bed that we no longer have, but I pried out the staples and saved the wood). 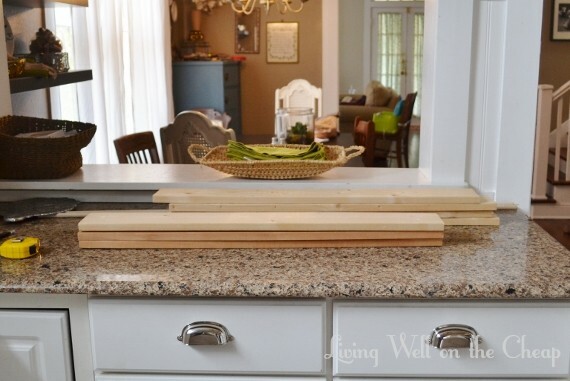 The boards were 30″ long so I cut them down into a bunch of 10″ pieces (to fit nicely on our 13″ wide doors). 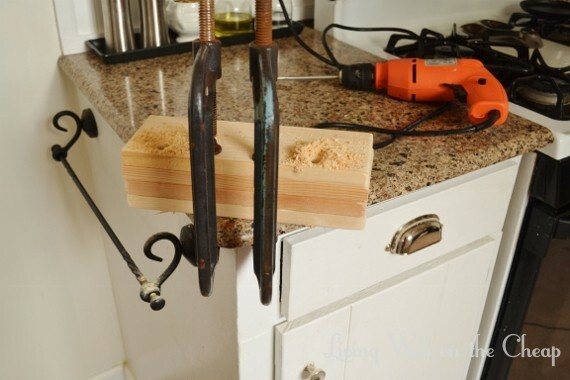 Then I used a 1/2″ spade bit to drill two holes in eight of the pieces. I clamped them together and drilled several simultaneously both to save time and because the exit hole seemed to always get torn up really badly. By clamping them together I had fewer boards with a lot of damage to sand down. See how the top board on this stack is kind of messy but the one lower down has a nice clean hole? That’s why I clamped them together. 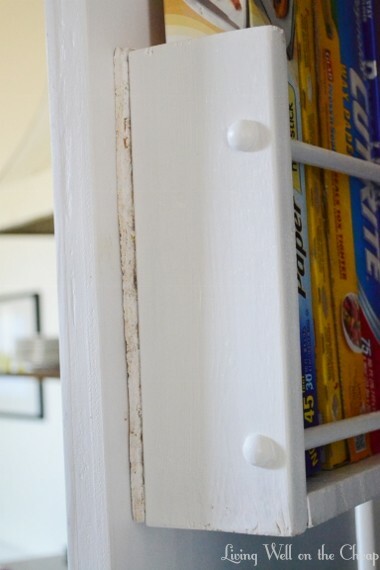 Also in this photo you can see a 1/2″ wood cap (sold near the dowels at Lowe’s) that I later used to cover each hole. 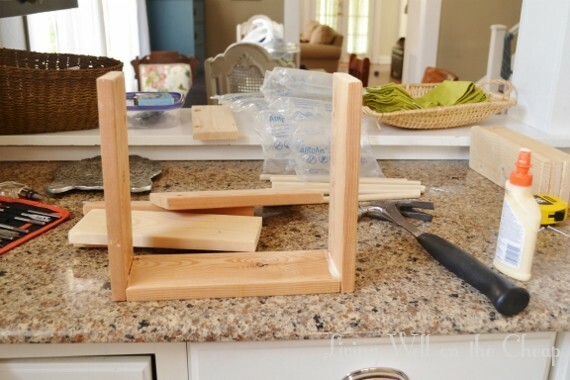 To assemble each unit, I put two drilled pieces perpendicular to the ends of a piece that had not been drilled, then secured it with nails and glue. Unfortunately the boards were too thick for the 3/4″ brads in my brad gun so I had to hammer them, which was kind of hard. 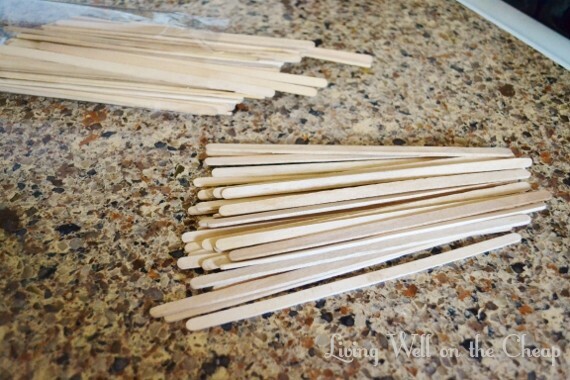 Then I put a 1/2″ dowel that I’d cut to length through each set of holes and finished each end with a bit of glue and a wood cap. 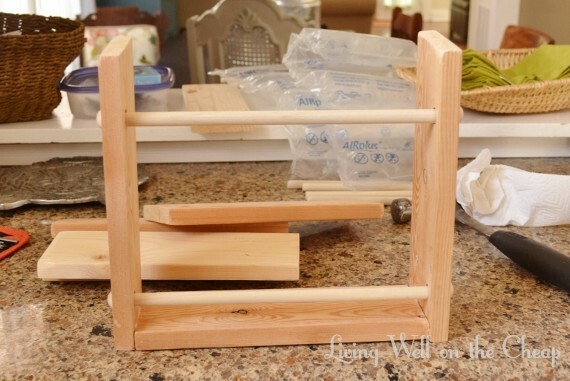 The piece pictured below was for foil/plastic wrap, but for the spice racks I added an additional shelf. 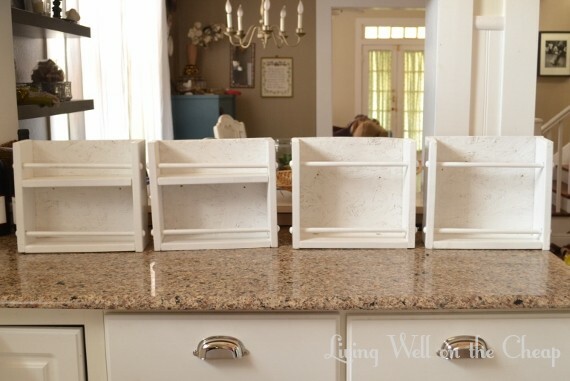 I primed them, painted them, then attached some painted pieces of 1/4″ plywood (also from my scrap stash) to the back with more nails and glue. 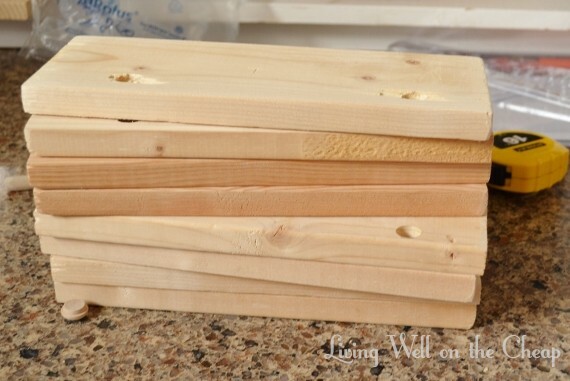 I also drilled two holes in the back of each for hanging. 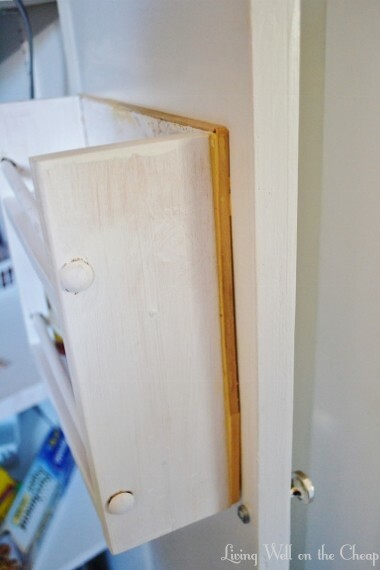 I attached them to the pantry doors with a screw through each of those holes I’d just drilled. It took some adjustment to get the positioning right so that they wouldn’t bump into each other while opening and closing, but once I had them in just the right spot my celebration was short-lived because I wasn’t pleased with the rough edge of the plywood. 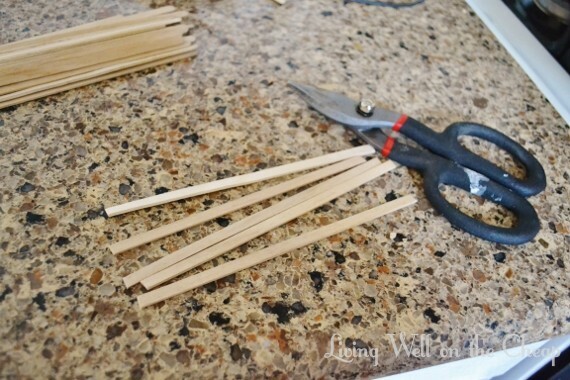 I couldn’t find any trim that was small enough at Lowe’s, so I picked up these wood sticks at the craft store and cut them using a pair of wire snips. I used them to trim out the edge of the plywood, attaching them with glue and the occasional nail and then applying wood filler to the edges. Then I just used a small brush to paint the trim and voila! 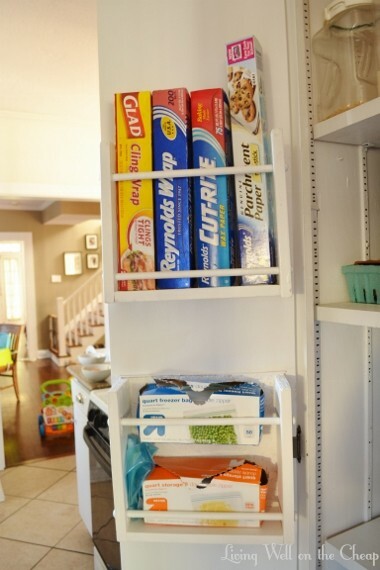 My new pantry storage! I went through my spices as I moved them and ended up throwing most of them away because they were expired by a year or more. That’s okay because now we’re down to just the ones we use the most and it freed up room for some medications/vitamins that we take daily. Moving all of this stuff to the pantry doors was part of my master plan to make room for the cutting boards under the area where we actually prep food and to pave the way for the microwave in the pantry. I’ve still got a couple more projects to do in there, including possibly starting from scratch with the door hinges because the one on the left is still not closing properly–I guess the reason why doors come prehung is because it can be hard to get right! these came out really well– great job!! I’m impressed! They look great and so functional! They are super functional. I love them!